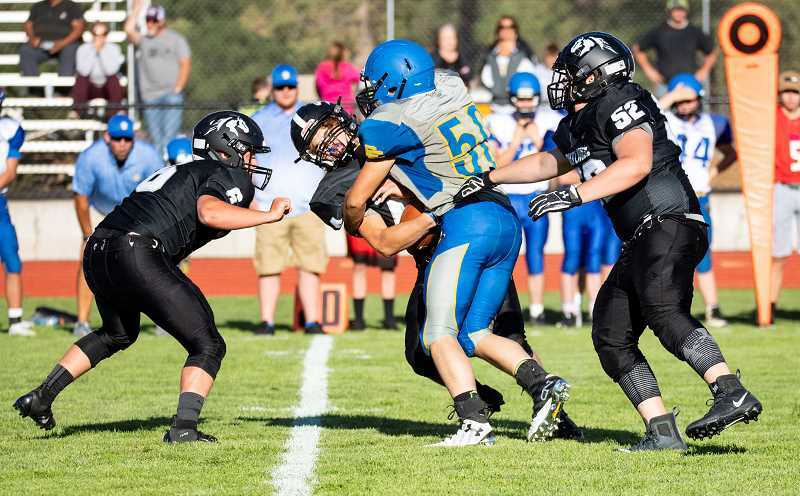 The Crook County High School defense looked stout Friday night at Sisters as the Cowboys won the Sisters Jamboree. Crook County held all three of their opponents scoreless in the competition, which pitted the Cowboys against Culver, Sisters and Madras. 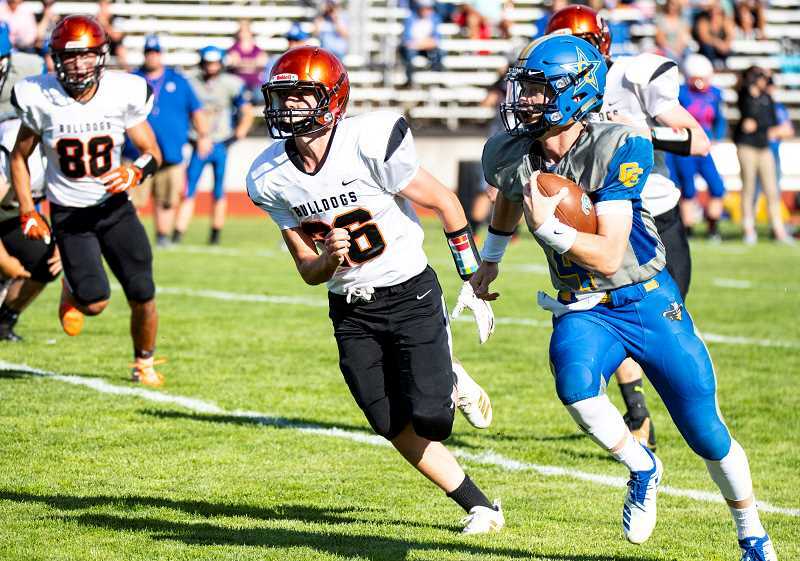 "Our defense looked really good," Crook County head coach Ryan Cochran said. "We executed well. We lined up well and did everything we were asked to do, but we still missed some tackles and had a little bit of assignment issues. But for the most part, it was pretty encouraging for a jamboree how we are looking on defense." The Cowboys allowed just two first downs the entire evening in the jamboree. The event format gave each team 12 offensive and 12 defensive plays against each of their three opponents. Crook County started on defense in each of their three quarters of play with the defense looking dominant. The Cowboys intercepted three passes during the scrimmage and had eight tackles for loss in their 36 defensive plays. At times, Crook County also looked good on offense, although they had three touchdowns called back because of penalties. "At times, we moved the ball really well," Cochran said. "But obviously, we have to clean up penalties and those types of things that obviously killed us. This was our first chance to go against somebody else. We've been preparing hard, and I think that for a first outing, there were definitely some positive things that happened." In their opening round against the Culver Bulldogs, the Cowboys were especially dominant. Culver had just three plays for positive yardage in their 12 offensive plays. Crook County gained 15 yards on their first play from scrimmage as quarterback Brody Connell scrambled around the left end for a big gain. Three plays later, Zach Mauras carried the ball up the middle for a 13-yard touchdown. Four plays later, Connell carried the ball around the right end for an apparent touchdown, but the play was called back for a holding penalty. Against Sisters, the Cowboys held the Outlaws to just one first down. The Cowboys also had three plays that ended in negative yardage for the Outlaws. In addition, Jacob Kleffner intercepted a pass and ran it back for a big gain. Once on offense, penalties once again plagued the Cowboys. After a completed pass from Connell to Dominic Langley put the ball on the 25-yard line, Connell pitched to Knudtson, who carried the ball inside the 1-yard line. However, the play was called back because of a block in the back. On the next play, Connell pitched to Kleffner, who sprinted into the end zone, but once again, the play was called back by a penalty. After an incomplete pass, Connell connected with Garett Bernard for a 15-yard touchdown strike, on the Cowboys' final play from scrimmage. 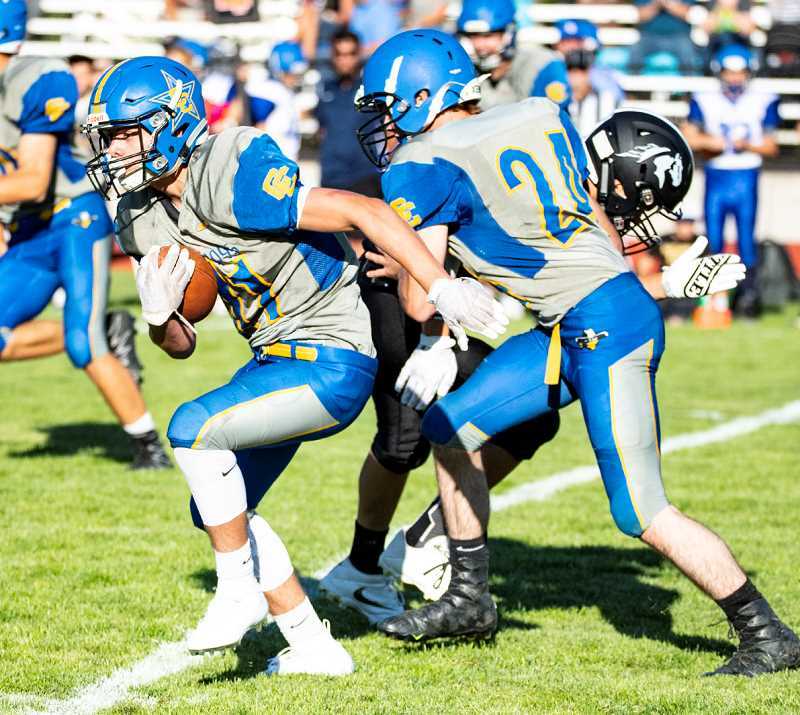 Crook County's defense was dominant again against the White Buffalos as the Cowboys intercepted their third pass of the jamboree. The Cowboys then scored twice in their 12 offensive plays as Knudtson carried the ball around right end, and Ethan Cossitt caught a pass from Connell. Crook County had a third touchdown called back because of a penalty and had two more scoring opportunities. Early in the scrimmage, Connell scrambled before throwing a ball down the field to Cossitt. The pass was short and Cossitt dove, and initially appeared to have the ball, before a Madras defender was able to dislodge it. Then on the final play of the day, Connell threw a pass to Langley in the opposite corner. The ball was high, and Langley leaped high in the air, nearly making a one-handed circus catch. However, he was unable to control the ball before stepping out of bounds. "We competed well," Cochran said. "The big issue today was trying to get better. That's our motto. Every day we break at the beginning of practice, our goal is to get better and even our jamboree today that was our focus was getting better. I'm not a score guy, but yeah, our defense shut down every team, and we didn't allow a touchdown today. But we weren't focusing on that. We were just trying to get better, and I think we accomplished that." Cochran added that the team still has some work to do before their opening game of the season, a road game at Ridgeview. The two teams square off Friday, Aug. 31 at 7 p.m. The two teams haven't played for several years, but the Ravens came out on top the last year the two teams met. Following Friday's game at Ridgeview, the Cowboys will host defending Class 4A state champion Cottage Grove on Friday, Sept. 7 also at 7 p.m.
"Every time we step on the football field, we are getting better," Cochran told his team following Friday's jamboree. "The effort was there today. That was awesome to see. That being said, we have to get a lot better before Ridgeview."